On this trip, our team headed to Mbang, a small village nestled in the rainforest in Cameroon. 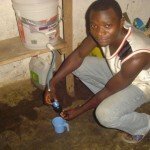 Thanks to Water for Life Charity, we took 50 water filters along. Our goal was to finish a clinic that would allow the Baka tribe to receive affordable healthcare. Because of the high infant mortality rate, children are not given names until the age of 5. We run four Aids Orphan Rescue Units in Cameroon, where 800 children get care. National staff along with students from Bible school personally deals with illnesses such as typhoid, while there, but they persevere. With this latest delivery of water filters, roughly 800 orphaned children, along with staff, have clean and safe drinking water. Three years prior, a well in the area had been dug, but when mercury was discovered in the water it was shut down, leaving a spring located 20 minutes away as the sole source of water. After getting the new water filters set up, our entire team remained healthy and was surprised at how good the water tasted. In addition to being lightweight, the filter is extremely easy to set up and use. 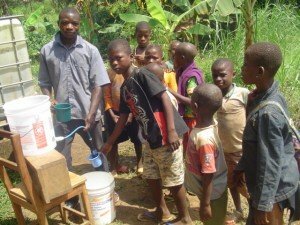 Being able to supply these orphan units with filters is a true blessing. Thank you, and we anticipate more testimonials in the near future from other healthy staff, students, and orphans.